Wallace Chung (鍾漢良) recently began filming in Xiamen for his upcoming romantic drama, Flowers Shall Send Us on Our Way <一路繁花相送>. Based on a novel of the same name by writer Qing Shan Luo Tuo (青衫落拓), Flowers pairs Wallace with mainland Chinese actress Jiang Shuying (江疏影) to tell the story of a young couple who finds their love rekindled after being separated for ten years. In Flowers Shall Send Us on Our Way, Wallace portrays Lu Fei, a seemingly perfect Prince Charming, who unexpectedly encounters the stubborn and rebellious young lady Xin Chen, played by Jiang Shuying. Despite their clashing personalities, they find themselves drawn to one another and eventually fall in love. However, they later separate, and it is not until ten years later, when Lu Fei lets go of his newly burgeoning company overseas and returns to search for Xin Chen, that they rediscover the meaning of their love. 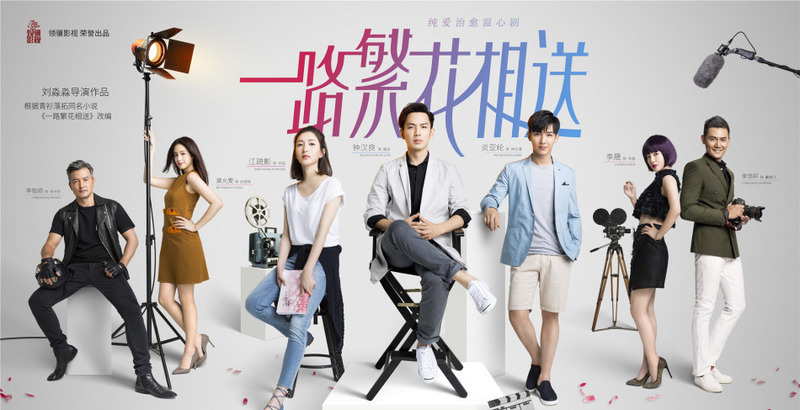 The production company behind Flowers admitted that although several revisions had been made to the screenplay, the underlying theme is still similar to that of the original novel – loving one’s first love until old age. Flowers also boasts investments of near 200 million RMB, with all of the scenery and props carefully selected so as to bring an aesthetic breath of fresh air to viewers. 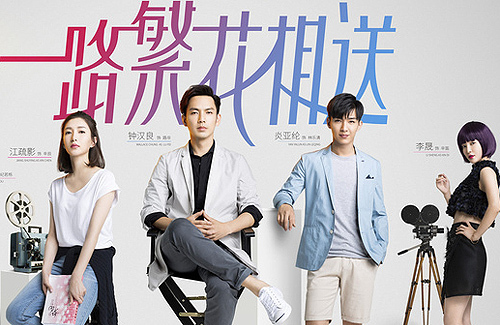 A newly unveiled poster of Flowers shows off the cast members in a film-crew setting; as the main characters, Lu Fei and Xin Chen take on the roles of director and screenwriter, respectively. Also present in the poster are Taiwanese actor Aaron Yan (炎亞綸), for whom Flowers will be his first mainland Chinese drama appearance; mainland Chinese actress Li Sheng (李晟); mainland Chinese actor Li Haoxuan (李浩軒); Malaysian Singapore-based actor Christopher Lee (李銘順); and Taiwanese-American actress Christina Mok (莫允雯). Flowers is expected to air next year and will be broadcast on Dragon TV and Jiangsu TV. i think 鍾漢良 debuted in bk many years ago but his career never picked up. i was surprised that i saw him on a chinese tv show a few years ago and learned how popular he has gotten in china.